We have patterns and books for anything you want knit or crochet, including internet access to ravelry. All Magazines and books are 50% off. We have baskets including Lantern Moon, Buttons mostly from Skacel, samples to try on before you buy yarn to make them. 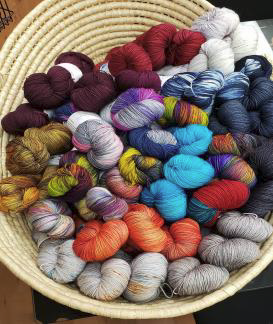 See newest arrivals at right from Colour Adventures, Sweet Merino dk, and Dia Sock. We are presenting our summer sale early for Woolith Fair, draw for your discount, anywhere from 50% off all regular priced items. We also will have kits put together for quick shopping, and samples priced to sell. If you are in need of lunch or dinner stop while in Steveston, there are over 90 places to eat, including the Juice Truck! Parking: If there is no parking on Second Avenue, customers can park in the parking lot behind the store. You can access this via an alley that is entered from Moncton by Steveston Coffee on the south end, or from Chatham behind Ichiro’s Restaurant on the alley’s North end. The back door to the store is just to the left of the construction trailers.